Cherubic hymn : for SATB choir and organ / Paul Stanhope ; text from The Liturgy of St James. A setting of a small section of the ancient liturgy of St James, translated into Latin. Instrumentation: SATB choir with divisi and minor solos, organ. Difficulty: Medium — Suitable for cathedral standard choir or good standard amateurs. Commission note: Commissioned by Choir of St James' Church with funds provided by Australia Council. Music Board. 30 Mar 2019: at Music On Music (The Great Hall, University of Sydney). 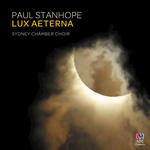 Featuring Sam Allchurch, Sydney Chamber Choir. 16 Aug 2014: at Cantos Sagrados (Verbrugghen Hall). Featuring Brett Weymark, David Drury, Sydney Philharmonia Choirs. 15 Aug 2014: at Cantos Sagrados (St Patrick's Cathedral, Parramatta). Featuring Brett Weymark, David Drury, Sydney Philharmonia Choirs. 29 Jul 12: St James Church, King St, Sydney. Featuring Choir of St James' Church.